Friday, April 5, 2019 at the Atikokan Royal Canadian Legion. 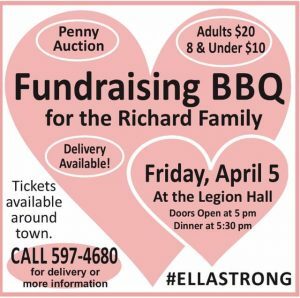 Come out and support the Richards Family. Doors open at 5:00pm, Dinner at 5:30pm. Adults $20, Children 8 and under $10 There will be a penny auction. Delivery available. Call 597-4680 for more information.